Below is a diagram showing the calls and data-flow between the entities in A2Billing. A2Billing can provide a number of services to the end customers including, but not limited to, Wholesale, business and residential VoIP origination and termination, calling card and call-back services, and special applications requiring telephony and billing. A2Billing supports origination and termination using a variety of technologies such as VoIP, PSTN (PRI, BRI and analogue circuits) and GSM gateways. A2Billing has a number of payment methods including online payment processors including Paypal, as well as manual payment and top-ups using vouchers via an IVR or the customer's portal with full accounting and reporting. A2Billing supports commission agents allowing online signup and affiliate marketing, as well automated signup via a simple telephone call providing easy customer acquisition. 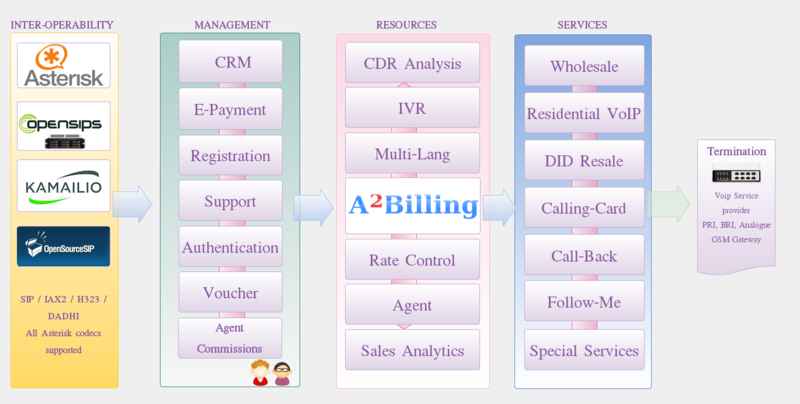 The architecture of A2Billing consists of a database server, Asterisk telephony server and a web-server for administration, agent, customer and online sign-up. Usually these servers are hosted on the same physical hardware, but can be distributed across multiple servers to increase the capacity. A SIP proxy can be added to load balance calls across multiple Asterisk servers and assist with NAT traversal.